Welcome to Online Reasoning Test in AffairsCloud.com. We are starting Cumulus Course for SBI Clerk 2018 Main Exam and we are creating sample questions in Reasoning section, this type of Question will be asked in SBI Clerk 2018!!! Directions.Q(1-5): Study the following information carefully to answer the given questions. There are Seven different dealers – A, B, C, D, E, F and G sold Washing Machines starting from Monday to Sunday(of the same week) not necessarily in same order. 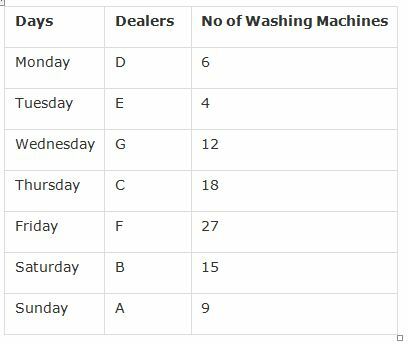 The number of Washing Machines sold by the Seven Washing Machine dealers in seven different days are 4, 6, 9, 12, 18, 15 and 27(not necessarily in same order). There are two dealers between the dealer F and the dealer who sold 4 Washing Machines. The dealer A sold Washing Machines on one of the days after Friday. On Wednesday, the number of Washing Machines sold are 12. The difference between the number of Washing Machines sold on Monday and Friday is the multiple of the number 7. Dealer B sold Washing Machines on one of the days immediately before the dealer that sold 9 Washing Machines. There are two dealers between B and G. There are three dealers between the dealer F and D. C not sold the least number of Washing Machines. The sum of Washing Machines sold on Wednesday and Saturday is more than ten and the sum equals to the number of Washing Machines sold on Friday. The difference between the number of Washing Machines sold by dealer B and G is less than five. The dealer who sold 9 Washing Machines not on Friday. The dealer F sold the Washing Machines on one of the days after the dealer who sold 4 Washing Machines. The dealer who sold more than 12 Washing Machines(not an odd number) is immediately after the one who sold 12 Washing Machines. Dealer F sold more number of Washing Machines than dealer D.
How many washing machines are sold by dealer A? Which of the following combinations of “dealer – Day” is True with respect to the given arrangement? Which of the following dealer sold Washing Machines immediately after A? In this arrangement, A is related to Monday, F is related to Wednesday then B is related to? None of the given options is true. What is the difference between the sum of washing machines sold by Dealer A, B and C together to the sum of washing machines sold by Dealer E, F and G together? Directions(6-10) Study the following information carefully and answer the given questions. Seven people – P, Q, R, S, T, U and V – are sitting in a straight line with equal distance between each other, but not necessarily in the same order. Some of them are facing north and some are facing south. Each likes different rivers i.e. Ganges, Brahmaputra, Godavari, Indus, Narmada, Kaveri and Yamuna. The person who likes Indus faces south direction and only one person can sit to the immediate right. Two persons sit between the persons who like Godavari and Ganges Respectively. Persons who sit at the extreme ends do not like neither Godavari nor Ganges. Only two people are sitting to the left of V. Only two people sit between V and Q. P sits second to the left of Q. The immediate neighbours of P face opposite directions(ie if one of the neighbours faces south then the other faces north and vice versa). Only one person sits between P and R. U sits third to the left of R. S is not an immediate neighbour of Q. Both the immediate neighbours of R face the same direction(i.e if one neighbour faces south then the other neighbour also faces south and if one neighbour faces north then the other neighbour also faces north). P faces the same direction as R. T faces north. Q sits on the immediate left of T. The person who likes Godavari sits exactly in the middle between the person who like Indus and Narmada. Neither S nor T like Brahmaputra. The person who likes Ganges sits to the immediate left of the person who likes Yamuna. Who among the following likes Narmada? Who among the following sits to the immediate right of S?